Layar certified partner Benet from Taipei, Taiwan has collaborated with Taipei’s Deptartment of Information and Tourism (TPEDOIT) to bring a unique interactive art experience to passengers on the city’s subway system. To help promote the launch of a brand new line of service, Benet and TPEDOIT have invited several artists to create interactive artworks which are displayed on the walls, windows and floors of a special train on the new line. Lucky passengers that board this train can use the Layar App to scan the artworks to see them come to life with videos, animations and more. “When I first scanned some of the images it felt like I was on a holiday, almost like going into the water, having it around me. It reminded me of my holiday,” said one passenger after experiencing the interactive art. The augmented subway cars have earned the attention of the local press. The video below is a news report from a Taipei news station (in Taiwanese of course) that takes a look at some of the art and interviews passengers for their reactions. Have a look at the art-covered trains and to see what happens when riders scan with the Layar App. To give it a try yourself, click here and scan some the artworks with Layar. Innovative Spanish multimedia artist Jose Carlos Casado is using Layar’s Augmented Reality and Interactive Print technology to connect his art with the digital world. Casado’s paintings are currently on display as part of the “Inverted Normals” exhibit, a group exhibition of works that provide access points to different ways of understanding the relationship between digital and physical spaces. The exhibit is located at the Rowan University Art Gallery in Glassboro, New Jersey – a contemporary gallery showcasing all forms of visual expression and new media. To experience Jose Carlos Casado’s unique 3D AR art, you can either visit the exhibit in New Jersey (open until December 20th), or scan these examples with the Layar App. Rogers, Canada’s largest provider of TV, Internet and wireless services, has teamed up with Canadian marketing agency Newad and Parisian street artist KASHINK to create a truly unique interactive experience to promote the Rogers Cup tennis tournament – all with scannable Layar content. For the campaign, named “A Creative Exchange” KASHINK was commissioned to paint one of her signature creations on the side of a building on the streets of Montreal, but with a tennis and mobile phone twist. The creature wears a headband and holds a mobile phone to its ear in one hand and a tennis ball between its giant fingers in the other, all while saying “FOUND IT!” over the phone. Near the ground of the four story artwork is a call-to-action urging those walking by on the sidewalk to download the Layar App and scan the painting to see more. Scanning the artwork reveals a timelapse video of KASHINK working on the giant artwork from start to finish over the course of a few days. “As the character I created has a very retro feel, applying technology to the mural and merging the two worlds is quite interesting artistically,” said KASHINK. Click on the image at the top and scan it with the Layar App to watch the time-lapse video of KASHINK at work! The Vlaams Radio Koor (Flemish Radio Choir) from Belgium has created a series of 3D postage stamp videos for a new line of stamps, and the results are incredible! As you can see in the video above, scanning one of the stamps with the Layar App displays a video playing inside a 3D model of a concert stage. The experience is incredibly immersive, as you can move in and out and look around inside the stage as a video message plays as the backdrop. The video and Interactive Print campaign were produced and created by Havas Worldwide, one of the world’s largest marketing agencies. To promote a concert series of music based on letters sent by Johannes Brahms and Clara Schumann, Havas created the idea for a “singing stamp” that comes to life. How did they achieve this effect? It’s built from two basic components of the Layar Creator: a 3D model (using the HOTSPOT button in the Creator) placed on top of a video button. The resulting effect of being inside the concert hall is terrific! 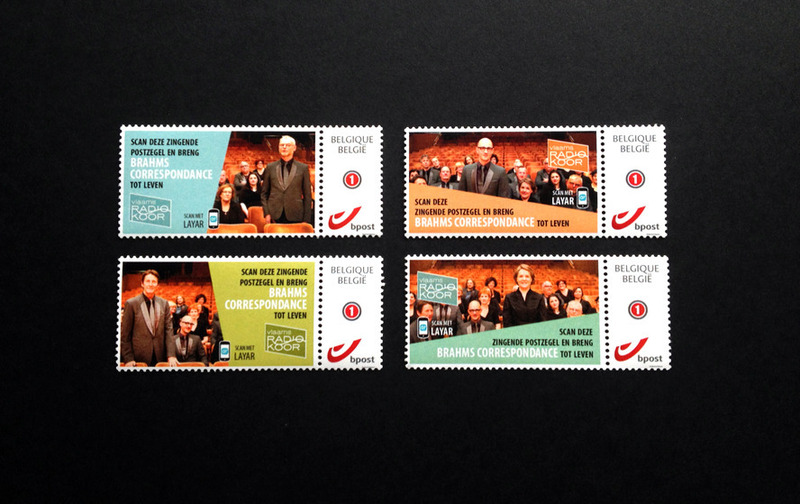 Read Havas’ press release about the “singing stamp” for more information, including how to order your own set of the stamps!